Fronted by clarinet, bass clarinet and vocals, the unique sound of Afternoon in Paris is delivered with a heartfelt and irresistible joie de vivre. 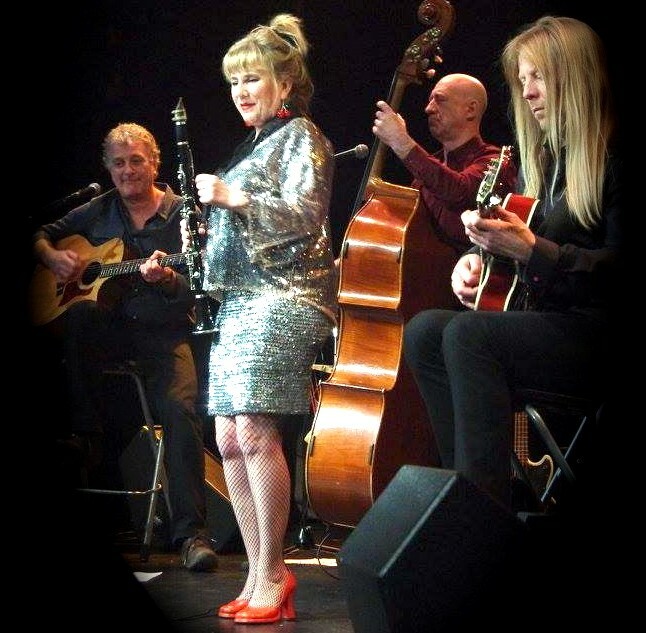 Rooted in the forties swing of Django Reinhardt, Benny Goodman and the Hot Club of France their music extends to encompass a plethora of styles from Latin to Klezmer, Bebop to Pop. With a cosmopolitan, multi-lingual range of songs, the result is a joyful fusion of music, virtuosic and entertaining. Be transported through the smokey jazz clubs of 1930s Paris and Hamburg to the grand cafés of Europe and South America. Bring your dancing shoes, there’s space on the floor – or just sit back and enjoy an evening of fabulous music. To book your tickets we operate an online ticketing system. Please visit www.carnegiehouse.co.uk for a full listing of our events. Please note there is a booking fee on all online ticket purchases. If you are unable to book online please contact our office on Tel: 01656 815757 or pop into Carnegie House (Monday to Friday, between 9am and 2pm).